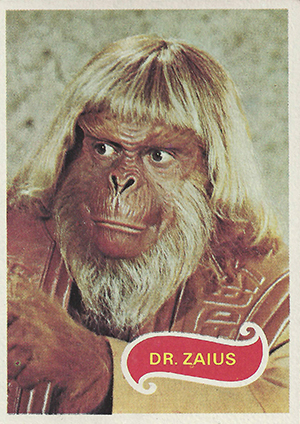 1975 Topps Planet of the Apes trading cards focus on the short-lived television show. It remains much more affordable than the 1969 set that centers on franchise's classic first film. Shop for 1975 Topps Planet of the Apes trading cards on eBay. The 1975 Topps Planet of the Apes set is a very manageable 66 cards, especially when price is factored into account. Unlike the film set, singles can often be found for a dollar or two in decent condition. The show lasted just one season, running from September through December, 1974. Low ratings led to its early demise. Card fronts are compliment the 1969 set. They both use the same design, which can lead to some confusion among collectors. A large photo has a thin white border. A short caption is placed inside of an orange scroll icon. 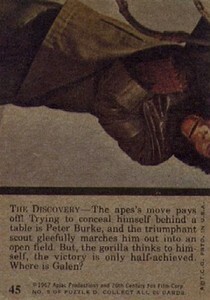 1975 Topps Planet of the Apes card backs have both a short writeup and a puzzle piece. The 1967 copyright date also leads some to think these are the film cards when their not. 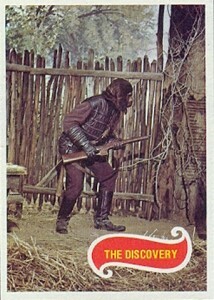 1969 Topps Planet of the Apes cards have different backs. They're green with illustrations. The puzzle backs are the easiest way to identify 1975 TV show cards. Singles from the set remain widely available. Unopened packs are also some of the easiest to find from the era. As a result, prices remain quick low when compared against many other sets from the era. 66 cards. Based on the television show, not the movie. Shop for cards on eBay. I was just looking in the attic now and discovered a box with a 105 of these cards inside. They vary from 1-66 with 10 missing and many have spares. Any idea what this could be worth, if worth anything at all? Thanks Tom from Wales. Same here Tom…. I found a bunch of these 1975 cards in my sock drawer. Must have been some time since I cleaned it out. Maybe about 30 of them. Don’t seem to be worth anything. (1) Unopened Mint Wax Pack 1975 Topps "Planet of the Apes"